While Cajun Turducken has been unique to Louisiana and out-of-staters had to come in to find genuine Turducken for sale, you can now order Turducken online and get that same fantastic Cajun quality delivered right to your door. 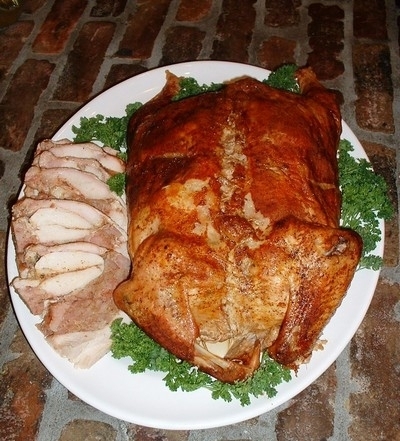 Once you try your first Turducken, which is a turkey stuffed with a boneless duck that has already been stuffed with a boneless chicken, you'll think you've died and gone to Cajun heaven. Yeah, it's a Cajun thing and no one does it like you'll find here at Cajun Ed's Hebert's Specialty Meats. Come into our store and get turducken fresh or frozen or, if you're out of town, order one up and take a Turducken delivery right to wherever you are. Either way, you won't be disappointed. And, while you're at it, pick up some Cajun Heat & Eat sides and appetizers. We've got 'em all. Allow 5 business days for processing of Custom Turducken Orders. Feeds 25. 14-16lbs. COOKING INSTRUCTIONS: Thaw 5 days in refrigeration. Remove plastic packaging. Bake breast down at 375°F for 4 hours covered and 1 hour uncovered or until the internal temperature is above 165°F.